The first display of David’s courage emerged when, as a young man, he confronted the nine foot giant Goliath of Gath armed with only a stick and a few stones. He stood before Goliath, when for 40 days experienced soldiers fled at the mere sight of the giant. With a slingshot he had made for himself and invoking the name of God, he threw a stone and killed the giant. It was then, when Saul made David commander of his troops. David’s success in the battle against the Philistines aroused Saul’s jealousy of him, a jealousy that made Saul try to kill David. He tried to make peace with Saul, but when he saw that the king did not think of peace, he fled. During the period he was away, he gathered 600 men and, at one point, in a cave, crept up on Saul. He did not kill the king. Instead he confronted him. Saul admitted that David would one day be king and pled for mercy for his bloodline, which David promised not to wipe out. Saul didn’t stop pursuing David though. Later David joined the Philistine king of Gath Achish, under whose flag he raided the cities of the nomad that harassed the Jews. All the spoils he gained from those raids he gave to the people of Judah, who, in their gratitude for David’s cleansing of their desert harassers, remembered him. They later appointed David king. After 7 and a half years of reign over the Jewish, David became king over all Israel and his first action was to capture what is now known as the City of David in Jerusalem. He fortified it and building a palace for himself. After he secured the kingdom, he wanted to build a temple to God, but the prophet Nathan told him he could not build the temple because he was a warrior and had shed blood and it was up to his son to build the temple. As he fought the neighbors of Jerusalem and his kingdom grew, he got older and the time for his son Solomon to reign over all Israel came. Solomon completed his father’s dream of building a temple to God. The Star of David is the symbol that many believe to be the shape of his shield or the symbol he used to decorate the shields that he wore in battle. There is no record to show this assumption is correct. Some scholars give the Star of David deep theological significance, because they say that the top triangle points upwards towards God and the other triangle points down towards the real world. 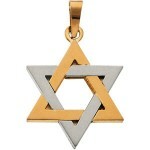 Others say that the three sides of the Star of David represent the three types of Jews: Kohanim, Levites and Israelite. Whatever the significance of the Star of David may be, it has protected this very strong and positive character in his most important life challenges. Therefore, the Jewish adopted it as well. In the 17th century, the Star of David was a popular way to identify synagogues, Jewish houses of worship, which had the symbol placed on the front entrance. The Star of David became an official symbol for Judaism in 1897. The Zionist movement adopted it as an emblem, but the symbol was controversial for many years after. Even when the modern Israel was founded, there were long debates whether to use the Star of David on its flag or not. If you are a Jewish believer or just like the shape of the symbol, or for any reason for that matter, you can always find the Star of David in the form of jewelry on the internet. You can purchase it in both gold and silver, in two dimension or three dimension form. Wearing the Star of David, you will probably be protected by God and the positive energy that has blessed David with a wonderful fulfilling life will work its miracles on you as well. The controversial symbol of the Star of David fascinates the world with its shape that gives birth to a lot of theological theories about its meaning. Now, you are able to buy jewelry with the shape that has been a subject of a lot of disputes and controversy in the past.